STOP HS2 | HS2 Bill to jump by £5.3bn to £55.4bn following Welsh pay out precedent. HS2 Bill to jump by £5.3bn to £55.4bn following Welsh pay out precedent. UPDATE – UK Treasury denies Welsh escalation in HS2 costs. Plaid Cymru claim Barnett victory. Whilst supporters of HS2 tried to dismiss previously unreleased sections of a report by KPMG, which showed many areas of the UK would lose out economically by HS2, the release of Barnett funding to Wales is in effect an admission that Wales will not benefit from HS2. 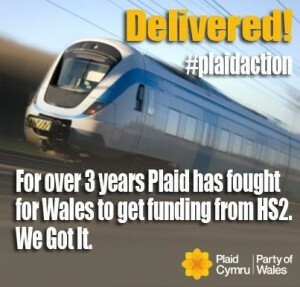 Plaid Cymru leader Elfyn Llwyd MP had told Parliament ten days ago that Wales should get a refund of up to £4bn if the HS2 “vanity project” goes ahead, whilst the Belfast Telegraph recently reported that Northern Ireland should receive £1.3bn, which together would add £5.3bn to the cost of the project. What is unclear is whether or not (notwithstanding the result of the Independence Referendum) Scotland would qualify for any payments. While it is claimed Scotland will ‘benefit’ from classic compatible HS2 trains running on existing lines north of Manchester, the newly released section of the KPMG report estimated annual economic losses as a consequence of HS2 for Aberdeen (£220.48m), Glasgow (£76.97m), Dundee & Angus (£96.46m), Falkirk (£17.61m), Stirling & Clackmannan (£7.74m), & Renfrewshire (£3.47m). The most obvious solution is to lower the track and put on double decker trains. As far as I can see the equipment is available to lay huge sections of track and something could be developed to scoop out 6 ft of earth before its relaid. Of course some services would need to be rediverted but I believe the population would go for this in exchange for cheaper tickets. I’d recommend spending the 50billion saved on 5 nuclear power stations to give the country security of power and the population cheaper electricity. Tell me why this doesn’t make sense!